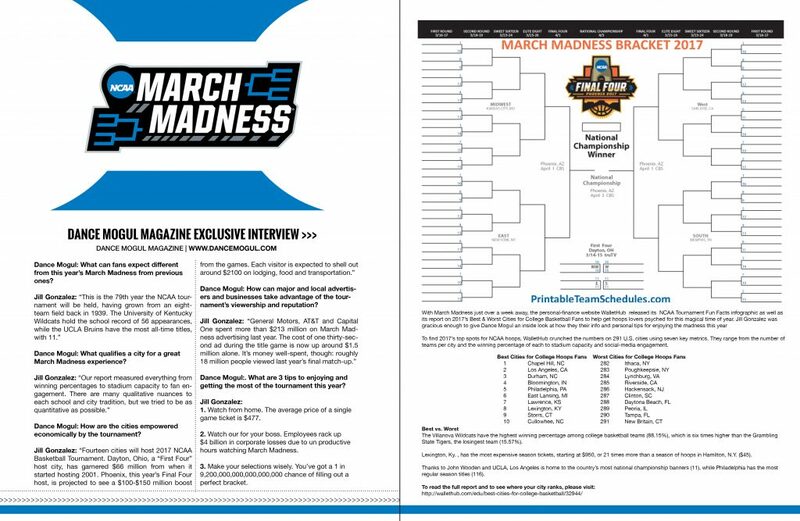 Dance Mogul: What can fans expect different from this year’s March Madness from previous ones? Dance Mogul: What qualifies a city for a great March Madness experience? Dance Mogul: How are the cities empowered economically by the tournament? Dance Mogul: How can major and local advertisers and businesses take advantage of the tournament’s viewership and reputation? Dance Mogul: What are 3 tips to enjoying and getting the most of the tournament this year? “1. Watch from home. The average price of a single game ticket is $477. 2. Watch hour for your boss. Employees rack up $4 billion in corporate losses due to unproductive hours watching March Madness.